Address : T1 Cam Nam - Hoi A n - Quang N am - Viet Nam. Below rates are net per room per night inclusive of tax and service charge. Hoian , originally known as Faifoo, was one of the busiest trading ports with the chinese and Japanese ( 16th and 17th centuries). The town is virtually unchanged since then,and has fitting been declared a World Heritage site. The picturesque riverside town is trying to maintain its distinct identity. 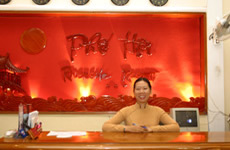 Pho Hoi Riverside Resort - 82 international standard rooms . 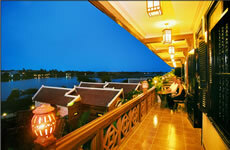 It is well combined of Pho Hoi Riverside Resort and Pho Hoi II hotel on one precinct. 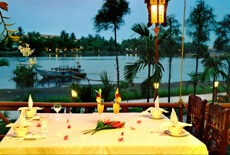 It is located right on the bank of romantic Thu Bon river. 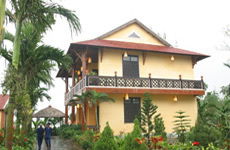 Pho Hoi Riverside Resort's location is very convenient. It only takes you a 5 minute-walk to the ancient town - the World Cultural Heritage, Hoi An market, post office, bank, beauty spots. Standing in the hotel terrace, visitors will have a panoramic view of the ancient town at night with twinkling lantern lights. Just a walk from the ancient town through Cam Nam bridge to Cam Nam Island - a tourist village - and from the bridge you will have an overview of the resort reflect in the river on your left hand side. There are many special villas and bungalows in the resort. All rooms have personal corridors and balconies where visitors can have an incredible view of the whole town with the busy watery life of Hoi An market. The whole resort is on a garden full of flowers and ornamental plants which offer visitors pastoral scenery in a peaceful ecological environment. Especially, there is an airy and spacious outdoor swimming pool designed in oriental architectural style. Besides, it is only in Riverside Resort where visitors can have wonderful sceneries at sunrise and sunset everyday. With such a location, visitors always enjoy the pure and fresh air. The Riverside Garden Pho Hoi Restaurant , first built in Hoi An Ancient Town, is located at the middle of a romantic BonSai garden. 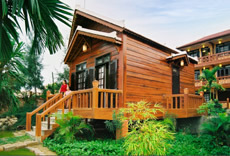 It is designed in Vietnamese traditional style with deck boards, coconut leaf roof and wattle. It only takes you a short walk to come to the center of town. If you are in the restaurant at night, you can enjoy a panoramic view over the river with antique and quiet houses, twinkling lantern lights. With the area of 400m 2 including 200 seats, it is an ideal restaurant for guests to hold meeting, birthday party, conference, seminar.. With the reasonable prices, good chefs and a warm staff, it is sure to make visitors very pleasant. Especially, the restaurant has also Vietnamese traditional dishes, such as: cao Lau, Banh Bao, Banh Vac, Banh Xuxe, Hoanh Thanh... It is really an ideal place to hold great parties.